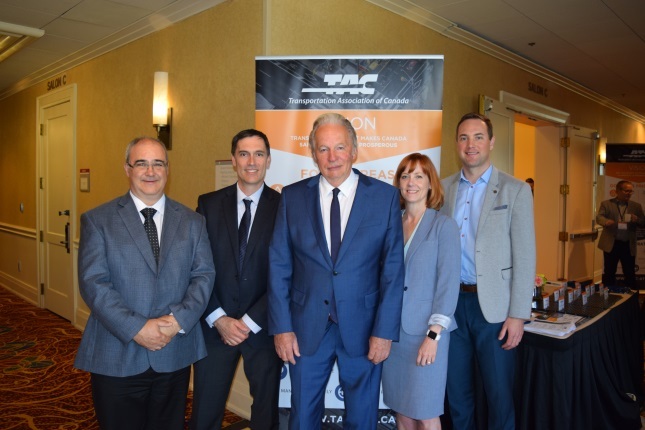 On June 21-22, 100 participants from government, industry and academia attended “Preparing for Connectivity and Automation in Canada’s Transportation System” in Toronto. The workshop was organized by the Transportation Association of Canada (TAC), Transport Canada and Intelligent Transportation Systems (ITS) Canada with the assistance of CAVita LLC. The purpose of the workshop was to build a shared understanding of connected and automated vehicle CV/AV development and implementation across North America, and to inform work by TAC’s members, partners and stakeholders as they prepare for and manage the introduction of CV/AVs in Canada. The workshop concluded with participants breaking into discussion groups, where they addressed key themes including planning and policy; operations and freight; safety and infrastructure design; smart cities; and digital infrastructure, physical infrastructure and data. Key concepts: Connected vehicle (CV) technologies enable robust wireless communication between vehicles and elements of the physical infrastructure to underpin driving assistance applications. Types of CV communication include vehicle-to-vehicle (V2V), vehicle-to-infrastructure (V2I), and V2X which extends to transit vehicles, cyclists and pedestrians and other road users. Automated vehicle (AV) technologies replace certain human driving functions, possibly including elements of planning, sensing and vehicle control. Highly automated vehicles (HAV) are equipped with Society of Automotive Engineers (SAE) Level 3-5 automated driving systems (ADS), and at the highest levels are known as autonomous or driverless vehicles. Wide deployment of HAVs is expected to involve a convergence of CV and AV (CAV) technologies. A CAV future would involve highly automated vehicles that rely on digital connections to nearby vehicles and/or infrastructure, and that offer transformational safety benefits. Many experts further anticipate that CAV technology will involve electric vehicles (EVs), and that it could also accelerate smart cities and other forms of urban innovation. Wide deployment of CV/AVs will be preceded by an extended, problematic transitional period in which they will need to interact with human-controlled vehicles on streets and highways, and during which human drivers will need to interact with their vehicles partially automated driving systems. Current status: CV and AV technologies are both progressing rapidly. In the CV arena, V2I deployment efforts have gained traction with significant opportunities for smarter infrastructure. AV technologies are advancing dynamically and are grappling with challenges including the need for adaptive safety guidance and infrastructure consistency. Many players are involved in developing ADS standards and testing related technologies. Most research and development is carried out by industry, while some open-environment AV platform development is being carried out by universities. All levels of government have a responsibility for the safe introduction of CV and AV technologies, in collaboration with industry and academia. Challenges: While there has been strong global progress with CV technologies, issues remain with respect to spectrum availability, quality and management. Canada, however, is well positioned with its reservation of the 5.9 GHz spectrum for CV/AV applications. CV implementation raises privacy and cybersecurity issues for both motor vehicles and infrastructure, which are heightened when AVs are added to the mix. AV and CV technologies also generate massive data streams and generate major questions related to data ownership, access, privacy and competition. Crash liability surrounding CV/AV technologies is unclear, and insurance companies that currently insure drivers will have a changing role. There is also a lack of public confidence in AV technologies, and stakeholders need to work together to earn that trust. Preparations for CAV deployment: Public agencies at all levels are accelerating action to prepare for CV/AVs through policy development and scenario planning. Federal guidelines for evaluating the safety of CV/AVs will be an important step. For provinces and municipalities, the safe introduction of CV/AVs will require consistent and effective standards for road design, signage, pavement markings, traffic signals and maintenance practices, as well as traffic laws. A close ongoing dialogue between the owners and operators of roadway infrastructure and their industry partners will be vital. Voluntary guidelines, industry standards, and memoranda of understanding will provide a supporting framework, while industry-government-academic collaborations will continue to be represented among the CV/AV consortia that operate a growing number of on-roadway and off-roadway test beds. Other cross-sectoral work is needed on data ownership, cybersecurity, privacy, and risk and liability. CV/AV issues pertaining to freight vehicles represent another area where industry and government will have to partner for success. 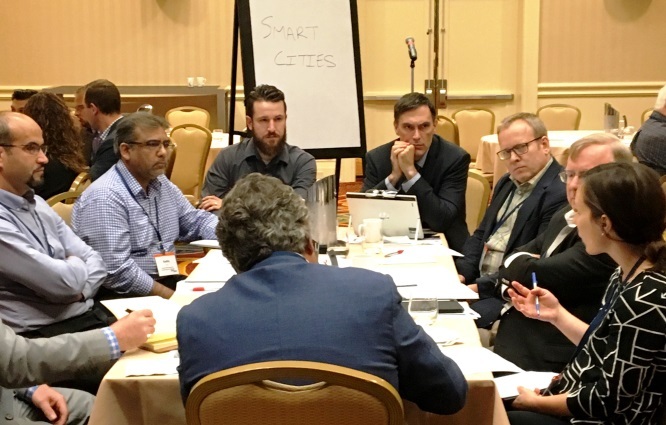 The Board of Directors has directed the creation of a group within TAC to lead engagement on this topic, and work is ongoing to create the terms of reference for a Connected and Automated Vehicles Task Force. The CV/AV Workshop created a long list of roles that TAC could consider over time, and a few of those ideas are identified below. • Keep TAC members informed about CV/AV deployment in Canada, the U.S. and globally. • Build TAC membership by engaging with private-sector CV/AV developers and suppliers. • Provide a forum for dialogue on CV/AV technology and policy involving industry, academia, consultants, provinces and municipalities. • Encourage collaboration among organizations, emphasizing the need for rapid progress and accepting some degree of duplication as essential to building broad capacity. • Maintain an inventory of CV deployments, and organize demonstrations of CV/AV technologies and applications. • Build knowledge about CV/AV impacts on smart cities programs including traffic services, revenues and land use. • Develop infrastructure best practices, guidelines and interoperability standards, with an initial focus on pavement markings, signage and traffic signals. • Develop technical memoranda to define key issues, identify solutions, and outline next steps. • Contribute to CV/AV data management, cybersecurity and privacy solutions, and the safety evaluation of HAV and ADS technologies. • Identify infrastructure needs to enable higher levels of vehicle automation. • Characterize CV/AV infrastructure capability levels, including smart cities platforms. • Address freight CV/AV issues such as platooning, signal prioritization and automated inspection technologies.